Picture your morning routine: you come out of the shower, spritz on some deodorant, splash on some perfume and spray on your outfit for the day…yes, it is possible! On Monday last week Dr Manel Torres, Spanish fashion designer and academic visitor at Imperial, wowed hundreds of academics and key industry figures during the Science in Style Fashion Show with his unique “spray-on haute couture”. The event, held at Imperial College London, showcased 10 years of work by Dr. Torres and Professor Paul Luckham, Department of Chemical Engineering and Chemical technology. The result was Fabrican, a liquid material that is sprayed directly onto the body and which dries in an instant to create the desired item of clothing. These items can even be washed and re-worn! Models made their way down the catwalk in white ensembles that represented famous structures from around the world, including Spain’s Guggenheim Museum and London’s Gherkin building. The inspiration for such a concept derived from Dr. Torres wanting to “make a futuristic, seamless, quick and comfortable material”. Fashion is just the tip of the iceberg too; these scientist are looking into expanding this ingenious material to the transport, medical and chemical industries, even suggesting the creation of sterile cans of the stuff to use as bandages! To watch a video of Fabrican in action and for a glimpse of the haute couture creations just click here – it really is amazing! At this year’s London Fashion, I said there would be some Fashionology surprises and Burberry has been on top of the game. Special guests to Burberry stores this morning will be enjoyed live streaming coverage of the SS11 LFW show as part of the ‘Retail Theatre’ concept. The idea is that shoppers can watch the show on 3×3-meter HD screens in 25 stores, in 16 countries around the world. At the end of the fashion show, employees handed out iPads on which the guests were able note of the products they would like to order in via the special Burberry iPad application. The bonus – delivery arrives in just 7 weeks which is months before the items will arrive in stores. It looks like Burberry is one fashion house that is fully embracing the world of high-tech, high-fashion! London Fashion Week SS11 is here – look out for Fashionology! Cue the models, the front row of stylish celebrities and the gorgeous collections! Today marks the start of the SS11 London Fashion Week and here at Fashionology we are très excited to see what gems come down the runway! This year fashion and technology have become closer than ever before with Henry Holland teaming up with Blackberry, Vivienne Tam designing laptops for HP and a number of designers whipping up fashionable iPad cases. London Fashion Week SS11 looks set to continue along Fashionology lines with some fantastic collaborations. A well kitted outVauxhall Fashion Scout media centre is being sponsored by Sony Vaio, so journalists and press can surf the web on shiny new laptops. HP has teamed up with ASOS to bring you ASOS Tee-V, a online channel that sets out to bring you up-to-date behind the scenes footage of London Fashion Week. Come back over the next few days and see what other fabulous Fashionology news we have to report from the LFW runways! 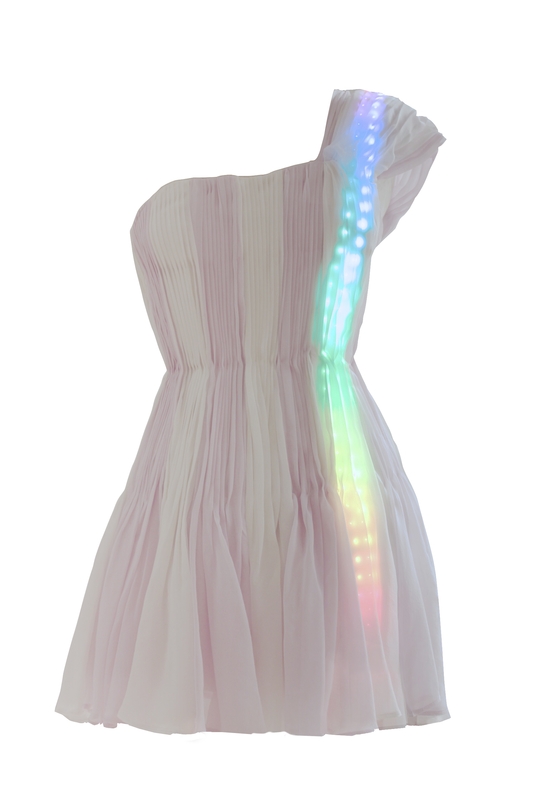 Selfridges to sell CuteCircuit LED dresses as seen on Katy Perry! Hooray, Fashionology is hitting Selfridges! Do you all remember how Katy Perry outshone everyone on the red carpet earlier this year at the New York Met Costume Institute Gala, in a LED decorated dress? Well now you can have your very own light up dress thanks to the exclusive launch of the K Dress by CuteCircuit as part of the Selfridges Christmas offer. The dress is made of pure silk and contains tiniest LED’s in the world, which are then embedded into its silk chiffon fabric. The lights are controlled by a tiny snap-on brain which plugs into underneath of the shoulder strap. This can be removed for recharging the battery via USB and for dry-cleaning the dress. The K Dress is shorter than the one sported by Katy Perry and is hand-crafted by CuteCircuit. If you want to brighten up your wardrobe like a Christmas tree in winter, then this dress is the perfect ensemble! K Dress by CuteCircuit (£1,350) will be available exclusively from the 2nd Floor at Selfridges from October 28th 2010.